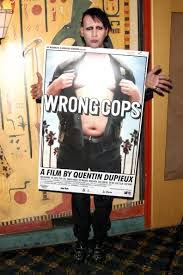 Although Dupieux may be at the forefront of this bizarre world of irreverent comedic violence, he is not the only one making this type of entertainment. Eric Wareheim and Tim Heidecker have been making ‘Tim and Eric’ productions in this vein for years, in any number of formats, and 2012 they released Tim and Eric’s Billion Dollar Movie. Eric Wareheim joins the cast of Wrong Cops as an officer with a disturbing way of using his power, not to mention eating a sandwich. Wareheim was out for the premiere, standing a good foot taller than anyone else in the room, with the possible exception of Marilyn Manson. Vanessa Sapien, Mark Burnham, Arden Myrin, Marilyn Manson, Gregory Bernard, Quentin Dupieux, Daniel Quinn. — at The Vista Theatre. Manson is one of the most bizarre casting choices in the film, and also the most inspired. He plays a reclusive teenager with a little bit of an attitude and braces on his upper teeth, and it is a breakout performance making this film. He was also in rare form on Wednesday, joking with friends and cast members. Also in attendance was Steve Little, best known for his role on HBO’s “Eastbound and Down,” but also the star of The Catechism Cataclysm, a comedy/horror film by Todd Rohal with the same sensibility of a Tim and Eric or Dupieux production. Also attending from the cast was Mark Brunham, Vanessa Sapien, Grace Zabriskie, Arden Myrin, Isabella Palmieri, Daniel Quinn, Jennifer Blanc, Ray Wise.